​A strange illness is sweeping through the kingdom of Colonodona bringing death and pain wherever it hits. Gwendolyn, a young hedge witch has made the startling discovery that the illness is one that has been created out of magic. Leaving her home, she makes the trip to the capitol to see the King. There, she is teamed up with the Duke Ipsinki and sent out to find the wizard responsible. As this is happening, the disease strike the capitol infecting Ipsinki's mother, Aud, and Sitnalta. It is now a race against the clock. Along the way, Gwendolyn realizes that Ipsinki is unlike any other man she has met, while the Duke sees that there is more to life than paperwork and duty. Regaining his love for adventure, he sees that he has more of a choice in front of him than he first realized. She watched Rebecca suffering. She knew this woman well. Before this, Rebecca had been strong and hardworking, helping her husband on the farm. A few weeks before, Gwendolyn had made her one of her fertility charms. Rebecca had wanted to start a family with her husband. She had been extremely healthy and happy. None of this made any sense to Gwendolyn. A horrifying idea crossed her mind. She rose abruptly, and Herman watched, an eyebrow raised in question. Gwendolyn ignored him and raced to her shelves that contained crystals and gemstones. She scanned them hurriedly, looking for a large opal, then grabbed it off the shelf and ran back to Rebecca. Placing the stone by her patient’s head, she focused all her energy on Rebecca and on what was killing her. As she watched Rebecca die, Herman tightly gripping his wife’s hand, she felt a sick feeling wash over her. Her mind became filled with a malevolent energy, and it was all she could do to not vomit. As Rebecca drew her last breath, the feeling passed. Gwendolyn looked at Herman, her eyes filled with rage and tears. “I couldn’t fight the sickness,” Gwendolyn said, her voice trembling. “I’m sorry, but I never can. There is something wrong here. My herbs should at least make people feel better, if not cure them outright. I decided to try and see what was causing them to fall ill. And…” She trailed off, feeling shaken to the core. “What is it?” Herman asked. His hand still held Rebecca’s firmly. “What?” Herman’s mind reeled at the implication. His heart was broken, and he didn’t want to believe what Gwendolyn was telling him. In spite of the fire still burning, Gwendolyn felt cold. She turned her face to the flames. Part of her almost wished that the person responsible for this was there. She would push them hard and fast into the fire pit with no second thought. She felt repulsed that she would even consider such a thing, yet when she thought of Herman’s pain and the grief on the faces of all the others whose loved ones she had tried to save, she knew that they would fully agree with her. She rose and fetched a pot of water. Pouring it over the fire, she turned and watched as Herman let the first of many tears fall from his eyes. “I’ll leave you in peace,” she said to him and turned to the door. Gwendolyn nodded and walked out into her garden to think. The Hedgewitch's Charm is a fun and exciting read that kept me flipping the pages. I thoroughly enjoyed this instalment of The Sitnalta Series! Kudos to Alisse Lee Goldenberg! 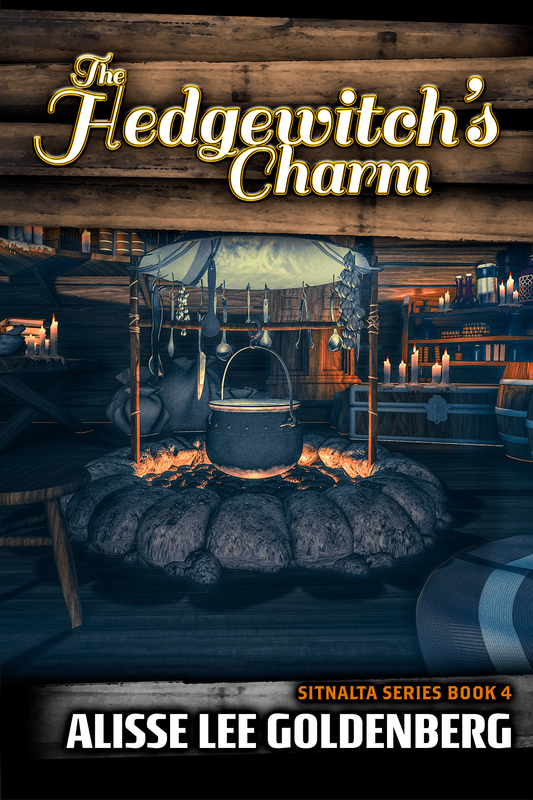 The Hedgewitch's Charm ​is available as an ebook and a paperback.